Sri Lanka collapsed like an origami skyscraper in a Godzilla attack, losing seven wickets in the space of 53 runs after tea, and 8 for 67 overall, as Ben Stokes delivered a searing spell of short-pitched bowling, and Adil Rashid spun it large from the other end – the pair collecting eight wickets between them in the innings. The hosts had, at one stage of the game, been looking at a score of more than 400, when Dhananjaya de Silva and Dimuth Karunaratne were at the crease. And yet, from the relative safety of 173 for 1, they managed to plunge swiftly, dramatically and at times flamboyantly to 240 all out. In the face of sustained attacking pressure from the fastest bowler in this match, and perhaps the biggest turner of the ball, their defences were meek, and their minds were muddled. Six batsmen did not get into double figures. Rashid’s figures were 5 for 49, and Stokes’ 3 for 30. The lead Sri Lanka conceded was a substantial 96. 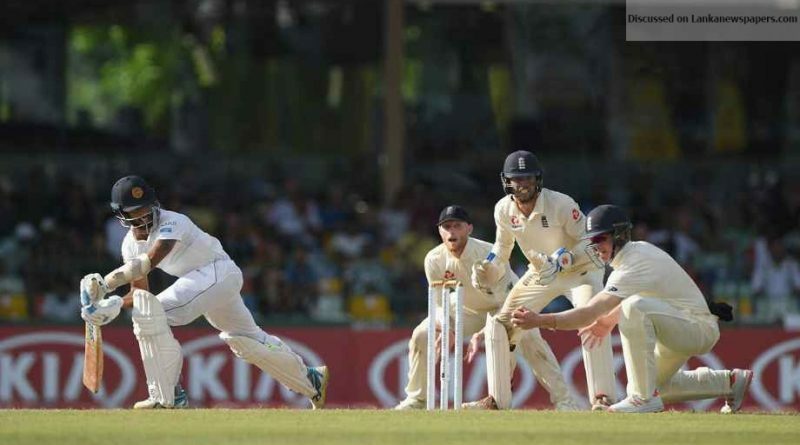 Karunaratne had been the first to depart after tea, having his inside edge sought out by a Rashid legbreak, for a catch to pop up to short leg, where Keaton Jennings easily snaffled it. Jennings has been immense at short leg all series, and perhaps now has had his best day in the position. Having earlier caught opener Danushka Gunathilaka brilliantly in the first session, following the batsman down the pitch in order to put himself into the best possible position to intercept the inside edge, he’d later also take two reflex catches to dismiss de Silva and Roshen Silva, taking his tally for the innings to four. Four of Rashid’s five wickets were via close catches, while all three Stokes’ victims were caught by Ben Foakes, having faield to control short balls. Angelo Mathews got a toe-end to a bouncer he tried to pull; Niroshan Dickwella was caught down the leg side off a ball aimed at his ribs, and another bouncer brushed Dilruwan Perera’s gloves. Rashid even effected a run-out late in the innings, to dismiss Lakshan Sandakan. Having seemed behind in this game at tea, England are suddenly bossing it.